Hello everyone, Helen O'Hara here from the Hoarder’s Art Room. 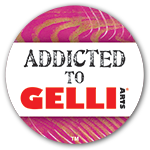 If you’re addicted to Gelli Arts® like me then you’ll have tons of Gelli Arts® mono-prints and even pretty clean-up papers stacking up in your studio. Today I’m going to show you how to use them to make some amazing faces to use in your art journals. I’m using face stencils by Jane Davenport but if you don’t have face stencils you can just draw a freehand face. I’m also using acrylic paint pens by Posca. 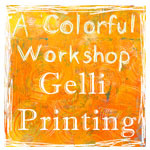 I used the 9"x12" Gelli Arts® Plate but you could use any size including smaller ones printed several times across your paper. First, print some papers using any technique. Try stencils, combs, bubble wrap and textures. Alternatively, just grab a handful of prints from your stash! Make sure the prints are totally dry and then draw around the stencil with a pencil. Add hair and extra details. Color the eyes and lips with Posca paint pens. Be sure to let the paint dry between layers. Use acrylic, ink, or watercolor paints to paint out the background. Thick acrylic will cover the whole background while ink or watercolor will let the background shine through. A white highlight in the eye will make the face come alive. Redefine the lines with a dark pencil or pen if necessary. You could collage these onto artwork or just as easily print straight into your art journal. The plain background makes a great place to add some text. These faces are just the beginning! Find out more at The Hoarder's Art Room. Wow, Helen!! 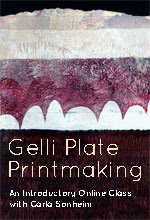 LOVE this technique.....hope you don't mind if I use it for my Gelli plate class in March. ( I will certainly give you a big shout out in the handout). Most of the women who take my classes love the printing part but would freak out if I told them we're going to draw faces.....so this is a life saver of a technique that helps everyone be a winner while producing such stunning results. Also love the transparent backgrounds using inks and watercolor. Thanks so much for sharing this. Lovely! Another fun thing to do is to use the Gelli prints for the hair.